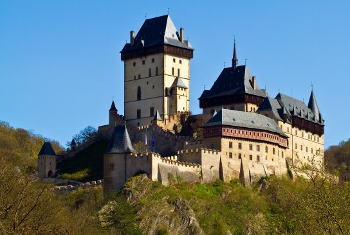 Visit a majestic gothic castle founded 650 years ago by Charles IV, King of Bohemia and of the Roman Empire. The castle Karlštejn was built in the 14th century as a place for safekeeping of royal treasures, especially the coronation jewels. The castle is located in a picturesque site on the Dragon's rock in the middle of dense forests, just about an hour's drive from Prague. For many visitors, this is one of the most popular destinations.